Tourism development, over-tourism and anti-tourism sentiments in context. Touristification is a curious phenomenon, feared and desired in almost equal measure by policy makers, businesses and cultural producers, residents, social movements and last but not least, tourists themselves. Much current reflection on over-tourism, particularly urban tourism in Europe, where tourism is experienced as an impossible burden on residents and cities, repeats older debates: tourism can be a blessing or blight, it brings economic benefits but costs in almost all other areas. Anti-tourism social movements, residents and some tourists declare ‘touristification impossible’, asking tourists to stay away or pushing policy makers to use their powers to stop it. Such movements have become evident in the last 10 years in cities like Barcelona and Athens and there is a growing reaction against overtourism in several metropolitan cities internationally. This workshop sets out to re-consider (the impossibility of) touristification. Frequently, it is understood simplistically as a process in which a place, city, region, landscape, heritage or experience becomes an object of tourist consumption. This, of course, assumes an implicit or explicit transformation of a resource into a commodity and carries an inherent notion of decline of value, from ‘authentic’ in its original state to ‘commodified’ after touristification. In other words, touristification is often seen as a process of ‘selling out’. But a change of perspective reveals the complexities involved. While some may hope to make touristification possible, it is sometimes actually very difficult and seemingly impossible: When places are unattractive, repulsive, controversial, difficult and contested, how do they become tourist attractions? Arguably in such cases value is added rather than lost in the process of touristification. These situations require a rethink not just of the meaning of touristification, but the underlying processes in which it occurs. How do places become touristically attractive, how is attractiveness maintained and how is it lost? Which actors initiate, guide and manipulate the process of touristification and what resources are mobilised? The aim of this two-day workshop is to provide an opportunity to challenge the simplistic and biased understanding of tourism as a force of good and touristification as desirable, so common among destination marketing consulting and mainstream scholarly literature. But it will equally question a simplistic but frequent criticism of touristification as ‘sell-out’ and ‘loss of authenticity’. We invite scholars, researchers, practitioners and PhD students to submit conceptual and/or empirical work on this important theme. We welcome submissions around all aspects and manifestations of touristification (social, economic, spatial, environmental etc.) and, particularly, explorations of anti-tourism protests and the effects of over-tourism. The workshop is open to all theoretical and methodological approaches. We are delighted to confirm keynote presentations by Scott McCabe, Jillian Rickly, Johannes Novy and Julie Wilson. The workshop is organised by the Tourism and Placemaking Research Unit (TAPAM) of the School of Business and builds on our first research workshop last year on ‘Troubled Attractions’, which brought together over 30 academics from the UK and beyond. The research workshop will take place in the University of Leicester School of Business. It will combine invited presentations by established experts with panel discussions and research papers. Participants will have the chance to network and socialize during a social event in the evening of Tuesday 4th June. There is small fee of £20 for participation. Registration includes workshop materials; lunch on 4th and 5th June 2019 and social event on 4th June. We invite submissions of abstracts (about 500 words) by 31st April 2019. Abstracts should be sent by email to: Fatos Ozkan Erciyas (foe2 (at) le.ac.uk). Tourism is undergoing major changes in the advent of social media networks and other forms of digital technology. This has affected a number of tourism related processes including marketing, destination making, travel experiences and visitor feedback but also various tourism subsectors, like hospitality, transportation and tour operators. Largely overlooked, however, are the effects of these changes on questions concerning inequality. Therefore, the aim of this session is to chart this relatively unexplored territory concerning the influence of technologically enhanced travel and tourism on development and inequality. In the wake of the digital revolution and its emerging possibilities, early debates in tourism studies have been dominated by a belief that new technologies are able to overcome or at least reduce inequality. These technologies, arguably, have emancipatory potential, inter alia, by increasing the visibility of neglected groups, neighborhoods or areas, by lowering barriers of entry into tourism service provision for low-income groups or by democratizing the designation what is considered valuable heritage. They also, however, may have homogenizing effects, for example by subjecting formerly excluded spaces to global regimes of real estate speculation or by undermining existing labour market regimes and standards in the transport and hospitality industries. These latter effects have played a part in triggering anti-tourism protests in a range of cities across the world. 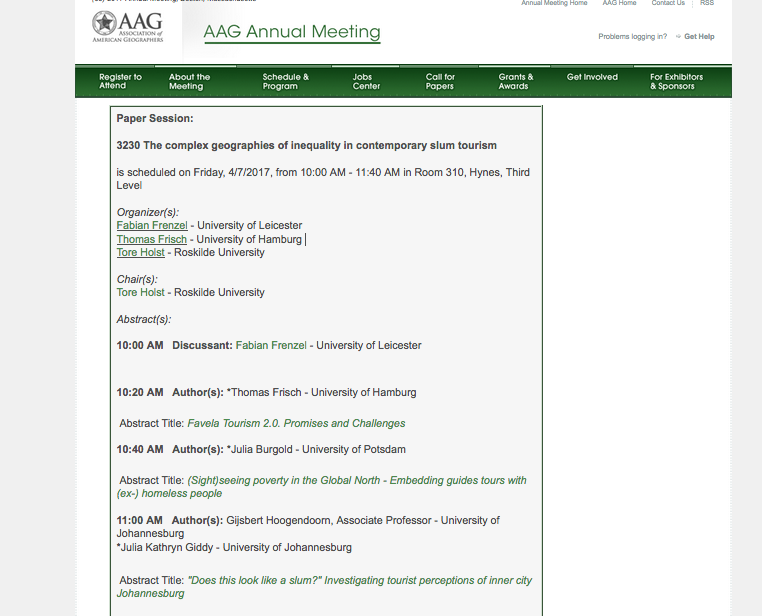 In this session we aim, specifically, to interrogate these phenomena along two vectors: mobility and inequality. Tourism and other forms of mobility have a stronger influence on the urban everyday life than ever before. Current debates indicate that this development inevitably entails conflicts between the various city users. The diverse discussions basically evolve around the intermingling of two categories traditionally treated as opposing in scientific research: ‘the everyday’ and ‘tourism’. The international conference Touristified everyday life – mundane tourism: Current perspectives on urban tourism addresses the complex and changing entanglement of the city, the everyday and tourism. It is organized by the Urban Research Group ‘New Urban Tourism’ and will be held at the Georg Simmel-Center for Metropolitan Studies in Berlin. KEYNOTE – Prof. Dr. Jonas Larsen (Roskilde University): ‚Tourism and the Everyday Practices‘ (KOSMOS-dialog series, admission is free). The preliminary programme has now been published and can be downloaded here. Posters presenting on-going research projects related to the conference theme are welcome. This conference investigates the motives, processes and effects of the commodification and global representation of urban poverty and violence. Cities have often hidden from view those urban areas and populations stigmatized as poor, dirty and dangerous. However, a growing range of actors actively seek to highlight the existence and appeal of “ghettos”, “slums” and “no-go areas”, in attempts to attract visitors, investors, cultural producers, media and civil society organisations. In cities across the world, processes of place-making and place-marketing increasingly resignify urban poverty and violence to indicate authenticity and creativity. From “slum tourism” to “favela chic” parties and “ghetto fabulous” fashion, these economic and representational practices often approach urban deprivation as a viable brand rather than a mark of shame. The conference explores how urban misery is transformed into a consumable product. It seeks to understand how the commodification and aestheticization of violent, impoverished urban spaces and their residents affects urban imaginaries, the built environment, local economies and social relations. What are the consequences for cities and their residents when poverty and violence are turned into fashionable consumer experiences? How is urban space transformed by these processes and how are social relationships reconfigured in these encounters? Who actually benefits when social inequality becomes part of the city’s spatial perception and place promotion? We welcome papers from a range of disciplinary perspectives including anthropology, geography, sociology, and urban studies. A new study on township tourism in Namibia has been published by a team of researchers from Osnabrück University including Malte Steinbrink, Michael Buning, Martin Legant, Berenike Schauwinhold and Tore Süßenguth. Guided sightseeing tours of the former township of Katutura have been offered in Windhoek since the mid-1990s. City tourism in the Namibian capital had thus become, at quite an early point in time, part of the trend towards utilising poor urban areas for purposes of tourism – a trend that set in at the beginning of the same decade. Frequently referred to as “slum tourism” or “poverty tourism”, the phenomenon of guided tours around places of poverty has not only been causing some media sensation and much public outrage since its emergence; in the past few years, it has developed into a vital field of scientific research, too. “Global Slumming” provides the grounds for a rethinking of the relationship between poverty and tourism in world society. This book is the outcome of a study project of the Institute of Geography at the School of Cultural Studies and Social Science of the University of Osnabrueck, Germany. It represents the first empirical case study on township tourism in Namibia. It focuses on four aspects: 1. Emergence, development and (market) structure of township tourism in Windhoek 2. Expectations/imaginations, representations as well as perceptions of the township and its inhabitants from the tourist’s perspective 3. Perception and assessment of township tourism from the residents’ perspective 4. Local economic effects and the poverty-alleviating impact of township tourism The aim is to make an empirical contribution to the discussion around the tourism-poverty nexus and to an understanding of the global phenomenon of urban poverty tourism. The visitation of areas of urban poverty is a growing phenomenon in global tourism (Burgold & Rolfes, 2013; Dürr & Jaffe, 2012; Freire-Medeiros, 2013; Frenzel, Koens, Steinbrink, & Rogerson, 2015). While it can be considered a standard tourism practise in some destinations, it remains a deeply controversial form of tourism that is greeted with much suspicion and scepticism (Freire-Medeiros, 2009). In the emerging research field of slum tourism, the practices are no longer only seen as a specific niche of tourism, but as empirical phenomena that bridge a number of interdisciplinary concerns, ranging from international development, political activism, mobility studies to urban regeneration (Frenzel, 2016). Slum tourism is sometimes cast as a laboratory where the relationships and interactions between the global North and South appear as micro-sociological encounters framed by the apparent concern over inequality. Beyond questioning the ways in which participants shape the encounters in slum tourism, structural implications and conditions come to the fore. Thus spatial inequality influences opportunities and hinders governance solutions to manage slum tourism operations (Koens and Thomas, 2016). Slum tourism is found to be embedded into post-colonial patterns of discourse, in which ‘North’ and ‘South’ are specifically reproduced in practices of ‘Othering’ (Steinbrink, 2012) . Evidence has been found for the use of slum tourism in urban development (Frenzel, 2014; Steinbrink, 2014) and more widely in the commodification of global care and humanitarian regimes (Becklake, 2014; Holst, 2015). Research has also pointed to the ethical implications of aestheticizing poverty in humanitarian aid performances and the troubles of on-the-ground political engagement in a seemingly post-ideological era (Holst 2016). More recently a geographical shift has been observed regarding the occurrence of slum tourism. No longer a phenomenon restricted to the Global South, slum tourism now appears increasingly in the global North. Refugee camps such as Calais in the north of France have received high numbers of visitors who engage in charitable action and political interventions. Homeless tent cities have become the subject of a concerned tourist gaze in the several cities of the global north (Burgold, 2014). A broad range of stigmatised neighbourhoods in cities of the global North today show up on tourist maps as visitors venture to ‘off the beaten track’ areas. The resurfacing of slum tourism to the global North furthers reinforces the need to get a deeper, critical understanding of this global phenomena. Mobility patterns of slum tourists also destabilise notions of what it means to be a tourist, as migrants from the Global North increasingly enter areas of urban poverty in the South beyond temporal leisurely visits, but as low level entry points into cities they intent to make their (temporal) home. Such new phenomena destabilise strict post-colonial framings of slum tourism, pointing to highly complex geographies of inequality. In this session we aim to bring together research that casts the recent developments in slum tourism research. We aim specifically in advancing geographical research while retaining a broad interdisciplinary outlook. Becklake, S. (2014). 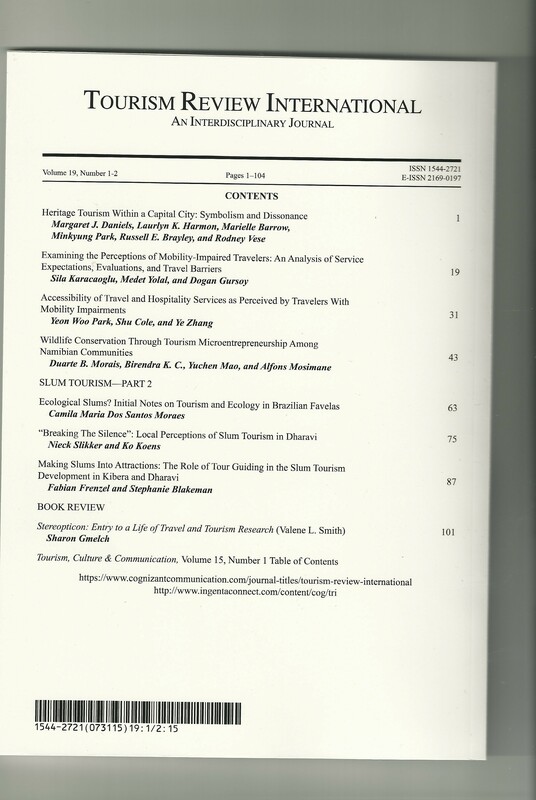 NGOs and the making of “development tourism destinations.” Zeitschrift Für Tourismuswissenschaft, 6(2), 223–243. Burgold, J. (2014). Slumming in the Global North. Zeitschrift Für Tourismuswissenschaft, 6(2), 273–280. Burgold, J., & Rolfes, M. (2013). Of voyeuristic safari tours and responsible tourism with educational value: Observing moral communication in slum and township tourism in Cape Town and Mumbai. DIE ERDE – Journal of the Geographical Society of Berlin, 144(2), 161–174. Freire-Medeiros, B. (2009). The favela and its touristic transits. Geoforum, 40(4), 580–588. Freire-Medeiros, B. (2013). Touring Poverty. New York N.Y.: Routledge. Frenzel, F. (2014). Slum Tourism and Urban Regeneration: Touring Inner Johannesburg. Urban Forum, 25(4), 431–447. Frenzel, F. (2016). Slumming it: the tourist valorization of urban poverty. London: Zed Books. Frenzel, F., Koens, K., Steinbrink, M., & Rogerson, C. M. (2015). Slum Tourism State of the Art. 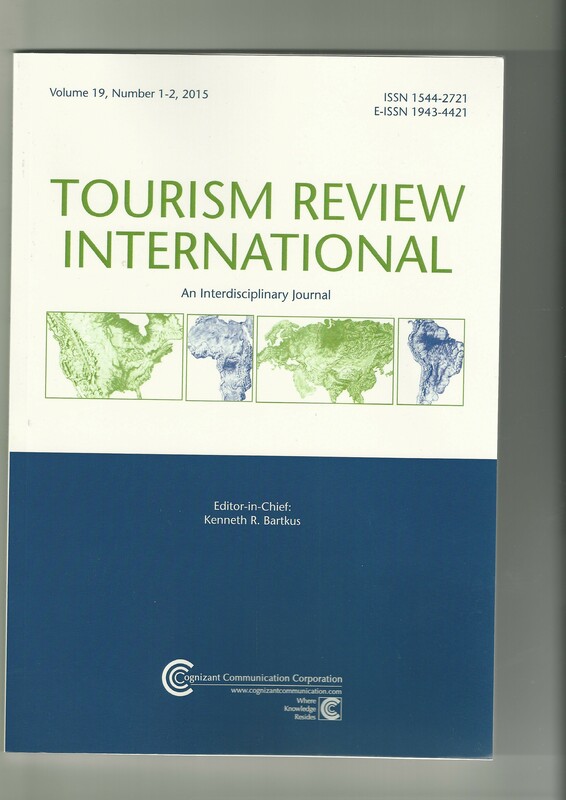 Tourism Review International, 18(2), 237–252. Holst, T. (2015). Touring the Demolished Slum? Slum Tourism in the Face of Delhi’s Gentrification. 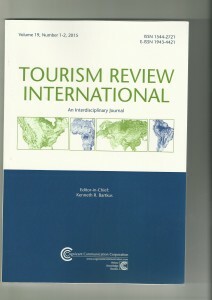 Tourism Review International, 18(4), 283–294. Steinbrink, M. (2012). We did the slum! Reflections on Urban Poverty Tourism from a Historical Perspective. 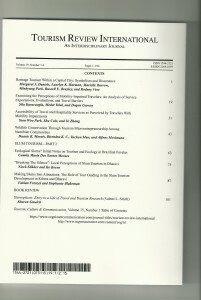 Tourism Geographies, 14(2), forthcoming. Steinbrink, M. (2014). Festifavelisation: mega-events, slums and strategic city-staging – the example of Rio de Janeiro. DIE ERDE – Journal of the Geographical Society of Berlin, 144(2), 129–145. In the provocative Slumming It, Fabian Frenzel explores the intriguing motivations and consequences of this form of tourism with a truly accessible, open-minded approach. He examines the strange allure that slums have for wealthier visitors, and he investigates the changes this curious attraction has led to on both a small and large scale: from gentrification and urban policy reform to the organization of international development and poverty alleviation efforts. Using case studies throughout the global south—including Rio de Janeiro, Bangkok, and cities in South Africa, Kenya, and India—Frenzel provides a comprehensive study of slum tourism and a controversial take on the potentially positive impact it may have on these struggling communities in the future. The book is based on a research project funded by the European Union Marie Curie Fellowship scheme. More publications and information can be found on the project website. The World Leisure Organisation has decided to dedicate their 2016 summer school to the memory of tourism researcher Douglas Ribeiro da Silva. 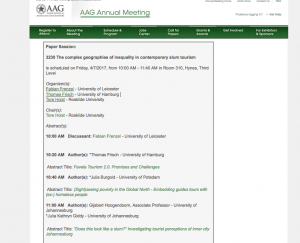 Douglas’ research focused on community perceptions of favela tourism in Paraisopolis, Sao Paolo and he presented his findings at the 2nd Slum tourism network conference in May 2014 in Potsdam, Germany. Douglas died in an accident while attending the WLO Congress in 2014 in Mobile, Alabamba. In his memory the WLO has named its next congress in Durban, South Africa as ‘Douglas Ribeiro da Silva Field School’. The WLO would like to offer a tribute to one of the students who participated in the last WLO Congress. Unfortunately, Douglas is no longer with us, but he left part of his legacy on the way he lived. In spite of all adversities in his life, he chose education and knowledge as the path to be followed in order to change society, to empower and emancipate people. His life was an inspirational example on how to overcome difficulties and discrimination with knowledge. We would like to keep his spirit alive by naming the Durban field school after him. Many researchers in the slum tourism network have expressed their gratidute to the WLO for this tribute to Douglas’ memory. The second part of the themed issues of the jounral Tourism Review International has been published. 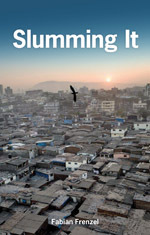 It features three papers on slum tourism, considering tourism in Vidigal, Rio de Janeiro, as well as in Kibera, Nairobi and Dharavi in Mumbai. 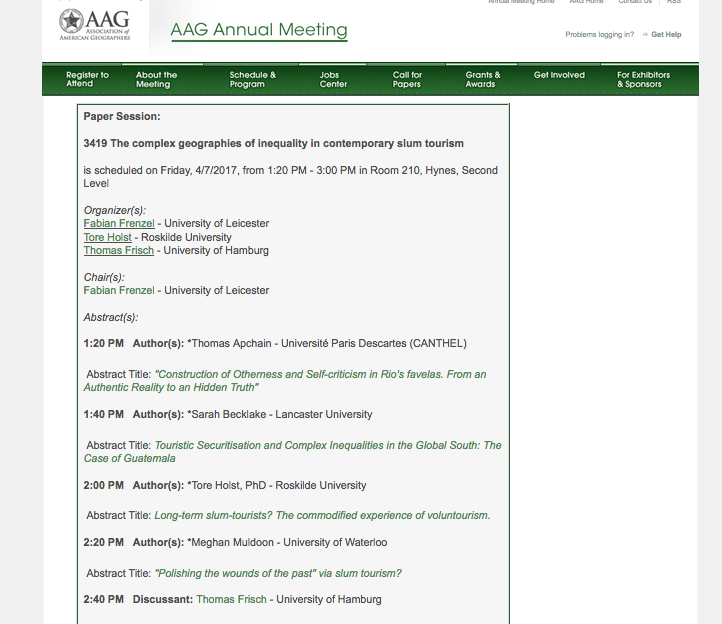 The abstracts of the three paper can be found here. 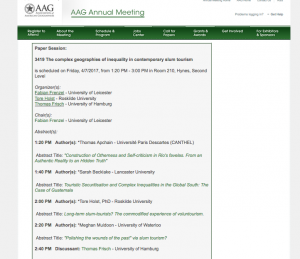 The papers were originally presented at the second slum tourism network conference in Potsdam in May 2014. Together with the first part of this themed issue and an earlier special issue in Zeitschrift für Tourismuswissenschaft, they form a series of significant contributions to the field.